What Slovenia has in spades are the mountains and what makes Croatia so special is the sea with more than 400 islands scattered around and a beautiful coast. Begin in slovenian capital Ljubljana, where you can easily spend few days to visit all the museums, art galleries, castle and Metelkova. After that make your way to Kamnik and the picturesque, high-altitude pasture land of Velika Planina. Heading back toward Kranj, continue north to impossibly cute little town Radovljica. Overnight here or a few kilometres north at Lake Bled. Use Bled or nearby Lake Bohinj for forays into Triglav National Park. Both are popular approaches for scaling Mt Triglav. Proceed northward to ski centre Kranjska Gora and the heart-stopping Vršič Pass (closed during winter). This high-altitude roadway (open May to October) zigzags for some 50km down to the Soča Valley. Following Soča River will bring you to the adventure capital of Europe, Bovec, and the WWI battlegrounds around Kobarid. This area is so beautiful that it makes it hard for everyone to move on to other places. When your adrenalin levels are full, head down towards the sea and visit some world famous caves and UNESCO sites on the way (Postojna or Škocjan). Further south you will start seeing typical mediterranean towns like Piran in Slovenia, or Rovinj, Poreč, Pula in Croatia. Croatian coastline gets better and better the souther you go and if you want to see the best, head to one of more than 400 croatian islands. The only problem here is, which one to choose, as they are all unique and different. When returning to Slovenia, drive inland and visit mesmerizing Krka falls and Plitvička lakes. After you see croatian capital, Zagreb, you can relax in the delightful spa town of Dolenjske Toplice. Otočec ob Krki and its stunning castle isn’t far away. Further east, Brežice draws visitors to its Terme Čatež spa complex and the wonderful Bizeljsko-Sremič wine district, known for medium-dry whites and reds and for repnice (caves for storing wine). Head north to Podčetrtek and another inviting spa, Terme Olimia. From here it’s a short distance through the Haloze Hills to atmospheric Rogaška Slatina, Slovenia’s oldest and largest spa, a veritable ‘cure factory’ with dozen hotels and far more treatments offered. Head north to the charming town of Ptuj and discover its Roman heritage. From Ptuj it’s just a short drive to this region’s biggest city and cultural hub, Maribor. Who could possibly resist seeing the world’s oldest (and still productive) grape vine, that dates more than three centuries back? End your travels in Celje with one of the most spectacular castles and on the day of your plane departure, we can organise a transfer directly to any of the airports nearby. Land in Ljubljana Airport and head into town (26 km) for some nice food and walks through the town. Visit the castle and sleep in town or in the camps on the outskirts of the city. In the morning you can indulge in a nice breakfast at one of several amazing coffee places in the town - city center is brimming with cafes, serving up great local food and freshly brewed coffee. Explore the town, as there is plenty to see and in bear in mind that in summer there are some interesting festivals that take place during the day. In the afternoon head north towards Kamnik (25 km) and Kamniška Bistrica (35 km) where you can take a gondola (or if you prefer, walk) to Velika Planina. This is astonishing mountain plateau with green pastures and typical and unique architecture of more than 50 shepherd's huts. You have some great options for walking and you will always find some great traditional food in huts - with the best views possible. Head north-west towards to the slovenian most known attraction - Lake Bled (54km). You can find many different trekkings in this area that best suit your fitness or visit incredible gorges (Vintgar Gorge), or Lake Bohinj and its unique and very old villages if you prefer. Eat a kremšnita (traditional cream cake) and sleep next to the lake - with sunset views over the Alps. You can visit lake’s island or a castle that lies above the lake on high cliffs. You will find many different trekking options that best suit your fitness here or visit incredible gorges (Vintgar Gorge), or Lake Bohinj and its unique and very old villages if you prefer. After that drive to Kranjska Gora (39 km), where you can see one of the nicest river springs Zelenci. Not far from the spring you can see the biggest ski jump in the world, where during winter guys can jump up to 251 m. Sleep in of three camps in the area, all situated next to the rivers and with incredible views. Head over the Vršič pass (14 km), where you will find yourself in the middle of high Alps and take time - every corner is worth stopping. You have even more hiking options here, with great views and astounding amounts of second world war remains. When you get over the pass, you enter Soča river valley, with its amazing spring and astonishing color. This is the adventure capital of Europe! Here you can do the longest European zipline, whitewater rafting, skydiving, paragliding, kayaking… All the way down along the river there are many camps and places to taste amazing local food like fresh river trout. It is hard to get away from unbelievable Soča river, but when you get to Nova Gorica, you can use the day to see Venice (145 km). You can park on the outskirts of the town and take a bus into the city. Have some nice italian food, gelato (italian ice cream) and a traditional boat ride in the canals. On the way back you can stop in Trieste, but we would definitely suggest that you sleep somewhere closer to Postojna. If you do not want to drive to Venice, stay in Karst region, where you can try great variety of wines, and visit old towns like Štanjel. Start in the morning with a visit to Postojna caves and Predjamski castle - the biggest attractions of the Slovenian karst. On the way down, you should visit Škocjan as well (30 km), with its UNESCO protected caves and beautiful nature - you will be rewarded with rivers, lush forests and friendly locals. After that, head towards the seaside (35 km) and sleep somewhere close to Socerb - best sunset views guaranteed! Spend your day on the beach and stroll around the beautiful cities of Piran, Koper or Izola, where you can see typical mediterranean architecture, cuisine and slow lifestyle wherever you go. In Portorož (Port of Roses) you can chill in beach bars, party, go to casino or shop on the promenade. If you prefer, visit Piran, everyone's favourite town on the Slovenian coast with Venetian-style architecture and small, narrow streets full of art. A really nice place to visit is also Sečoveljske soline (Sečovlje Salina Nature Park). This 750-hectare saltpan-studded area, crisscrossed with dikes and channels, has a wealth of birdlife – 290 species have been recorded here. All this coastal places have camps in pine forests, few meters from the beach. Enter Croatia and go to one of the towns full of history and amazing seaside like Poreč (61 km), Rovinj (86 km) or Pula (102 km). Relax on the beach during the day, shop and eat in the evening when temperatures get a bit lower. This historic towns have a special vibe and it is not unusual to see roman remains, even proper amphitheatre. Drive south and try not to stop every time you see some gorgeous bays, pine forests and seaside tavernas. You have 350 km from Rovinj to Krka Falls national park, and it takes some people many days to get there because it is really hard to leave and pass places on the way. But keep in mind, Croatia just gets better, more south you go. Krka falls and walks in the area are always among top things to do in the Balkans. Water is usually a bit colder than the sea - this will be the most refreshing stop in Croatia. You will find plenty of options to camp around here, and great eating options in Šibenik (12 km) close by. Go to Split and wander through the markets and roman forums, palaces and streets. Another city close by is Trogir, if you want to see more of traditional mediterranean architecture, full of surprises on every corner. When you have enough of busy cities, take a ferry to Islands. Šolta, Brač, Hvar, Korčula, Mljet and others are just stunning and it is not strange that people sometimes name them european Caribbean. You will soon realise that your holiday is not long enough and you would need few extra days to cover it all - if you don’t believe us, just google some of these amazing croatian islands! Head back to the land same way you came, with a ferry to Split. If you are heading back north (and not down to Dubrovnik or Mostar), we definitely suggest that you go towards Plitvička lakes (250 km). Its unique beauty was not discovered until very late, and it remains unspoiled and stunning. Great restaurants nearby, and nice camps as well. Make your way through croatian capital, Zagreb (137 km) with its interesting city centre and loads of shopping, sightseeing and eating options. If you manage, sleep somewhere close to Čatež ob Savi (36 km), where you have a lot of camping options next to spas in the area or close to Otočec on Krka (40 km, from Čatež), with its amazing castle. Relax in the spas in Čatež ob Savi or maybe a bit north in Olimje (41 km) where you can find one of the best spas in Europe, with 20 different saunas and great surroundings. You can visit some of the biggest Slovenian wineries here, as well as the oldest pharmacy in Europe, set in a stunning monastery still run by monks of this order. Travel up through Ptuj (51 km), the oldest recorded town in Slovenia. Stroll around the old city and up the castle with the view on the surrounding wineries and spas. Choose to go to Maribor (33 km), with the oldest vine in the world, or head north east for walking, biking or hiking on one of many wine trails. On the way back to Ljubljana, use your last day in Celje (54 km), where you will find a lovely city centre with many cafes and walking paths next to the river. Above the town, there is a spectacular castle with vast views and good restaurant nearby. In the afternoon you have options of caves, roman remains or a world famous beer fountain in a town Žalec, which is surrounded with hops fields. If you have a flight later in the day, you can buy few gifts in Ljubljana or have a last nature trip to Logarska Dolina (70 km). It is one of the nicest glacier valleys in Alps. You can visit a waterfall at the end of the valley and have a traditional Slovenian meal there and then head towards the airport where we will meet you. This is a suggestion for those with more time to travel. If you want more information and suggestions, details or explanations you can always contact us, or we can arrange a video call to discuss your travel plans and give you some local hints. If you want, we can book all the activities, ferries and camps for you for no extra charge. 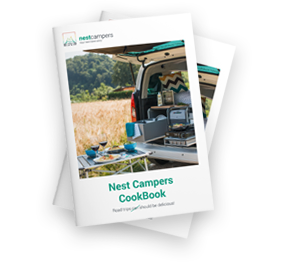 Book your Nest campervan now! Don't miss new travel stories and travel tips! 90 places to visit and things to do in Slovenia and Croatia. Camp cooking has never been easier or tastier! I agree with terms in Nest Campers privacy notice. I wish to receive e-news from Nest Campers d.o.o.